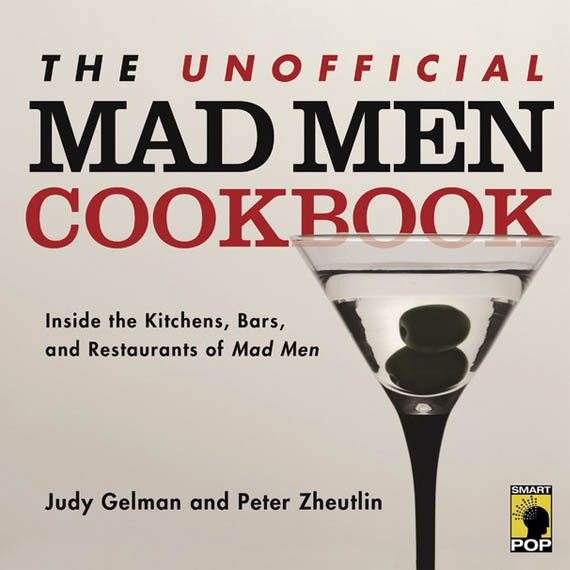 Actually, it is The Unofficial Mad Men Cookbook as no one wants to get sued by the "official" Mad Men. So after a seventeen month hiatus, the boys are back in town. There is a thriving business in putting together this type of tie-in cookbook. Some of them are just slapped together, but Judy Gelman and Peter Zheutlin have done a wonderful job with this one. One of the reasons that Mad Men has attained such a cult following is their exacting attention to detail. Creator Matt Weiner says it has become something of a game as viewers look for any little detail that is out of place. (Check out this short Q & A with property manager Gay Perello.) Gelman and Zheutlin have followed Weiner's exacting attention to detail. They have culled recipes from the popular cookbooks of the day as well as from some of the regular haunts of the Mad Men including, "21" Club, Keens Steakhouse, El Morocco, Stork Club, and Trader Vic's. There are recipes for Pineapple Upside Down Cake featuring the new electric skillet-frypan, Date nut bread from Pat Nixon's contribution to Hints from Heloise, and John Kennedy's favorite daiquiri from Bacardi's "Be A Drink Expert" pamphlet. The book is chocked full of tidbits and facts and recipes that would actually find their way to a Mad Men table. While definitely retro, The Unofficial Mad Men Cookbook has its own blog filled with more fun Man Men info. 1. Make the salad: Place lettuce in a serving bowl. Toss with dressing. 2. Sprinkle Parmigiano-Reggiano on top, garnish with egg yolk, pimento, anchovy filets, and croutons and toss well. 1. Make the dressing: Combine the water and lemon juice in a measuring cup and set aside. 2. Combine canola and olive oils in a measuring cup and set aside. 3. In the blender, combine the remaining ingredients and mix for 10 seconds. With the blender running, slowly begin to add the combined oils in a slow and steady stream. As you continue to add the oil, the mixture will begin to thicken. When the mixture thickens, thin it out with 1/3 of the water/lemon juice mixture. Repeat this process until all the oil has been incorporated. 4. Chill dressing until cold. Note: Place the bread in the freezer for 10-15 minutes before slicing to make it easier to cut even squares. Whole melted butter can be substituted for the clarified butter, but will brown the croutons faster. To make clarified butter, melt 4 tablespoons of butter slowly in a small saucepan. Remove from heat and allow to cool a bit until it separates. Skim off the foam that rises to the top, and gently pour the butter off of the milk solids, which will have settled to the bottom. 1. Pre-heat the oven to 350°F. Toss bread cubes in a bowl with the remaining ingredients. 2. Transfer to a baking sheet and bake for 10 minutes or just until slightly browned and crisp. Let cool at room temperature before serving. Store covered in an airtight container. While I am trying to get used to that fact that there are no more zombies on my Sunday nights, I will say that between Walking Dead and Mad Men the food is definitely better with Don than Shane. Next Week: Peggy is given new responsibility.